Proof that games make excellent teachers! 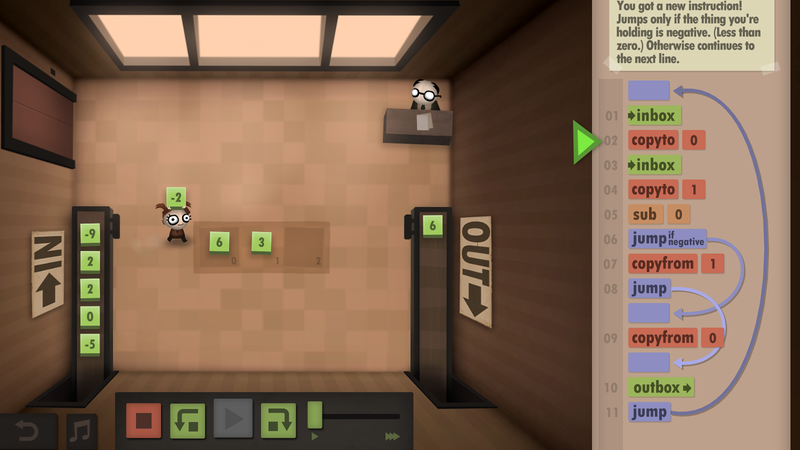 Human Resource Machine is a puzzle game in which the player progresses through a number of challenges, with each challenge meant to represent one year of your avatar’s life working at a some kind of large corporate company. The reason I’m recommending this game is because the puzzles require players to program…well kind of 😛 The logic for each puzzle is that you need to create a program that will take the input given to you on the left and sort it as defined by the challenge before outboxing the appropriate output to the right. This “program” is made up of a constrained list of commands which includes things like subtraction, addition, jumping and so on. The challenges range quite drastically in difficulty so there should be something for anyone even if you’ve never seen code logic before. While this game isn’t really about educating people to program, I think it can act as a very fun way to introduce some of the fundamental logic and ideas that need to go into completing tasks using a list of input commands, which is really all that programming is! In addition, while you can just complete a puzzle and move on, the game challenges you to complete the problem within a given number of steps and a given efficiency (how many steps are gone through on average to solve the puzzle), forcing players to hone their solutions down to perfection (just like I have to do at work!). Human Resource Machine can be purchased on Steam (link) or on the Nintendo Switch. I personally prefer the switch version as I like using the touch screen to drag and drop commands instead of a mouse, but either version works fine 🙂 Enjoy! Learn Japanese to Survive is going to be my very first game recommendation, and I’ve chosen it because it provides a clear example of how video games can be an excellent educational resource. The game is a very literal example of gaming to learn because, as the title suggests, it is entirely based on teaching you the basics of the Japanese Hiragana. The twist is that players learn to both read and write the Hiragana alongside fun and engaging RPG gameplay! The plot of the game is pretty simple with the idea being that the player needs to learn the Hiragana characters in order to proceed and beat the game. Players go through a series of nicely illustrated, bite-size lessons in which they are shown the characters, what they mean, and how to write them. They are then tested on these characters by having to fight actual people-sized versions of them in RPG battles! 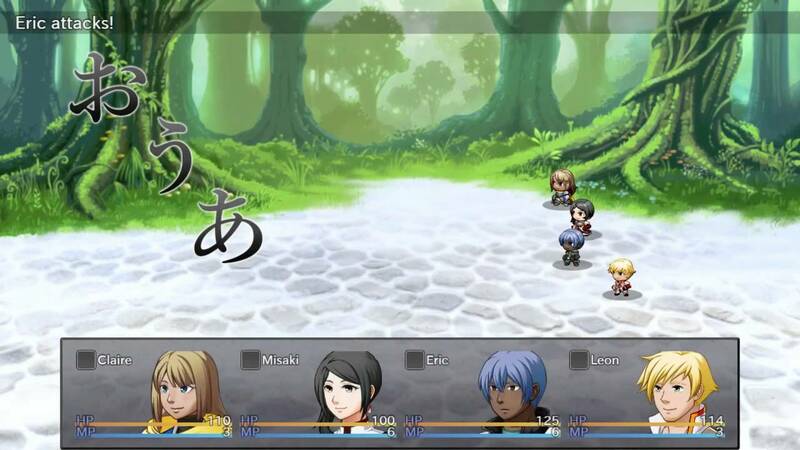 Enemy Hiragana warriors attack the player as they explore the world, and they can only be damaged by correctly giving their english equivalent . A number of NPCs add further flavour to the story with witty comments and side-quests in which you can learn useful words and sentences in Hiragana as well. Learn Japanese To Survive! 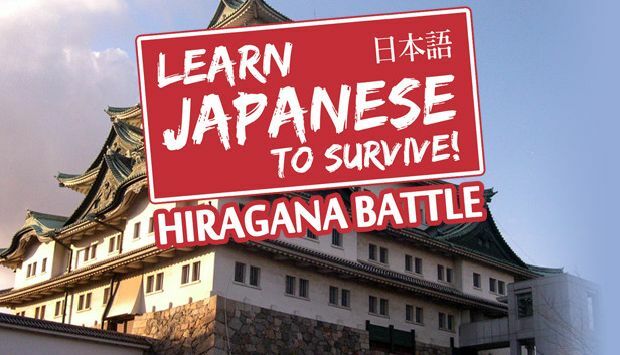 Hiragana Battle can be bought on steam for £4.99 – so it’s not even expensive! If you’re feeling keen you can actually buy this game along with the two other games in this series (one for the Katakana and one for the Kanji), and then you’ll be a true Japanese Expert! Reality is Broken is a book by Jane McGonigal that explores how the world we live in could be drastically improved by accepting video games and incorporating gaming practices into everyday life, a process she refers to as gamification. The book is entertaining, engaging and not overly technical so you don’t have to be a round-the-clock gamer to understand the subjects she is discussing. The general premise of the book is that life in reality is lacking a crucial ingredient; some spark that would make going about our lives more fun and engaging instead of (as so many people seem to feel) edging surely and steadily towards lethargy and boredom. McGonigal’s way out of this system of ennui is to bring gaming to many cornerstones of life, from how we educate our children, to systems of incentive in the work place and tasks involving mass cooperation. While I would say the book is rather one-sided, only displaying with great excitement the good points about gaming culture while carefully avoiding any valid criticisms, I personally found this book a thoroughly interesting read. It came as a breath of fresh air given the large amount of negativity usually expressed towards gaming in the wider media. If nothing else McGonigal’s book provides food for thought and a large source of inspiration for how the benefits of gaming might be used in a much wider context to help improve our quality of life. I mean wouldn’t you prefer that tasks such as going to work and keeping house became more like challenges to be overcome with tantalizing rewards instead of ordeals to be performed as quickly as humanly possible? I certainly would and if even some of the ideas in this book could be realized I think the world could become a much more lively place! Udemy: The place to go to learn the skills you need to start making video games! When I first decided I wanted to work in the video games industry I started searching for ways I could learn the skills I would need to actually make video games, and one of the best places I found was Udemy. Udemy is a website that provides access to literally thousands of online courses in a vast array of subject areas. In my case I found courses relating to learning programming languages, including C++, C# and Python, which were invaluable for getting to grips with the basics outside of a Computer Science degree (yes, you do not necessarily need a relevant gaming or computing degree to get into the video games industry – I didn’t have one and now I’m a gaming programmer and loving every minute 😉 ). Udemy also has a number of courses to help you learn the basics of various pieces of programming software. This includes Unity (a great place to start if you want to try out creating games using C#), Unreal Engine and GameMaker Studio. As a number of fully published and successful games have been created using this software, these courses can really help give your skills a boost, and act as a good test for whether you will truly enjoy working to create video games as a career! The one thing I should note is that many of the courses on Udemy are not free, however the site often has widespread sales and the course prices are well worth the skills they teach! Enter your email address to follow my blog and receive notifications whenever I post by email!